The zygoma forms a firm buttress for the orbit and typically fractures at its sutures. 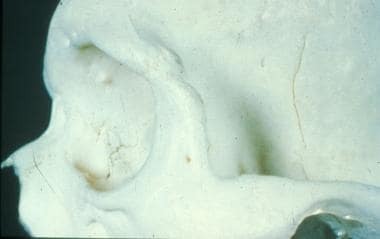 The zygoma is the main buttress between the maxilla and the skull, but, in spite of its sturdiness, its prominent location makes it prone to fracture. The mechanism of injury usually involves a blow to the side of the face from a fist, from an object, or secondary to motor vehicle accidents. Moderate force may result in minimally or nondisplaced fractures at the suture lines. More severe blows frequently result in inferior, medial, and posterior displacement of the zygoma. Comminuted fractures of the body with separation at the suture lines are most often the result of high-velocity motor vehicle accidents. Displaced fractures can lead to changes in globe position and facial contour if not properly realigned. Associated ophthalmic and intracranial injuries may occur and may carry separate prognostic considerations. Indicators of favorable outcome include bony union, absence of skeletal or soft tissue deformity, and a normal range of mandibular movement. It is essential to instruct patients to avoid forceful nose blowing. The disrupted orbital walls can allow air to be forced into the retrobulbar space, causing orbital emphysema, which may lead to pain and visual loss. Advise patients to call the surgeon at any time if orbital bleeding is suspected. Intermittent application of ice packs to the area of the fracture in the first 3-4 days after injury may aid in alleviating pain and edema. For excellent patient education resources, visit eMedicineHealth's First Aid and Injuries Center. Also, see eMedicineHealth's patient education article Facial Fracture. Gruss JS, Van Wyck L, Phillips JH, et al. The importance of the zygomatic arch in complex midfacial fracture repair and correction of posttraumatic orbitozygomatic deformities. Plast Reconstr Surg. 1990 Jun. 85(6):878-90. [Medline]. Song WC, Choi HG, Kim SH, et al. Topographic anatomy of the zygomatic arch and temporal fossa: A cadaveric study. J Plast Reconstr Aesthet Surg. 2008 Oct 21. [Medline]. Zingg M, Laedrach K, Chen J, et al. Classification and treatment of zygomatic fractures: a review of 1,025 cases. J Oral Maxillofac Surg. 1992 Aug. 50(8):778-90. [Medline]. Covington DS, Wainwright DJ, Teichgraeber JF, et al. Changing patterns in the epidemiology and treatment of zygoma fractures: 10-year review. J Trauma. 1994 Aug. 37(2):243-8. [Medline]. Rallis G, Stathopoulos P, Igoumenakis D, Krasadakis C, Mourouzis C, Mezitis M. Treating maxillofacial trauma for over half a century: how can we interpret the changing patterns in etiology and management?. Oral Surg Oral Med Oral Pathol Oral Radiol. 2015 Jun. 119 (6):614-8. [Medline]. Barry C, Coyle M, Idrees Z, et al. Ocular findings in patients with orbitozygomatic complex fractures: a retrospective study. J Oral Maxillofac Surg. 2008 May. 66(5):888-92. [Medline]. Salentijn EG, Boffano P, Boverhoff J, van den Bergh B, Forouzanfar T. The epidemiological characteristics of zygomatic complex fractures: A comparison between the surgically and non-surgically treated patients. Natl J Maxillofac Surg. 2013 Jul. 4 (2):214-8. [Medline]. Septa D, Newaskar VP, Agrawal D, Tibra S. Etiology, incidence and patterns of mid-face fractures and associated ocular injuries. J Maxillofac Oral Surg. 2014 Jun. 13 (2):115-9. [Medline]. Trivellato PF, Arnez MF, Sverzut CE, Trivellato AE. A retrospective study of zygomatico-orbital complex and/or zygomatic arch fractures over a 71-month period. Dent Traumatol. 2011 Apr. 27(2):135-42. [Medline]. Llandro H, Langford R. Reasons for plate removal after treatment of orbitozygomatic complex fractures. J Craniomaxillofac Surg. 2015 Jan. 43 (1):17-20. [Medline]. Colletti G, Valassina D, Rabbiosi D, Pedrazzoli M, Felisati G, Rossetti L, et al. Traumatic and iatrogenic retrobulbar hemorrhage: an 8-patient series. J Oral Maxillofac Surg. 2012 Aug. 70:e464-8. [Medline]. He D, Li Z, Shi W, Sun Y, Zhu H, Lin M, et al. Orbitozygomatic Fractures With Enophthalmos: Analysis of 64 Cases Treated Late. J Oral Maxillofac Surg. 2011 Jul 11. [Medline]. Soong PL, Schaller B, Zix J, Iizuka T, Mottini M, Lieger O. The role of postoperative prophylactic antibiotics in the treatment of facial fractures: a randomised, double-blind, placebo-controlled pilot clinical study. Part 3: Le Fort and zygomatic fractures in 94 patients. Br J Oral Maxillofac Surg. 2014 Apr. 52:329-33. [Medline]. Ord RA. Post-operative retrobulbar haemorrhage and blindness complicating trauma surgery. Br J Oral Surg. 1981 Sep. 19 (3):202-7. [Medline]. Laine FJ, Conway WF, Laskin DM. Radiology of maxillofacial trauma. Curr Probl Diagn Radiol. 1993 Jul-Aug. 22(4):145-88. [Medline]. Friedrich RE, Heiland M, Bartel-Friedrich S. Potential of ultrasound in the diagnosis of midface fractures. Clinical Oral Investigations. 2003. 7:226-229. [Full Text]. Parashar A, Sharma RK, Makkar SS. Treatment of simple zygoma fractures. Plast Reconstr Surg. 2008 Oct. 122(4):1285; author reply 1285-6. [Medline]. McLoughlin P, Gilhooly M, Wood G. The management of zygomatic complex fractures--results of a survey. Br J Oral Maxillofac Surg. 1994 Oct. 32(5):284-8. [Medline]. Randall DA, Bernstein PE. Epistaxis balloon catheter stabilization of zygomatic arch fractures. Ann Otol Rhinol Laryngol. 1996 Jan. 105(1):68-9. [Medline]. af Geijerstam B, Hultman G, Bergstrom J, et al. Zygomatic fractures managed by closed reduction: an analysis with postoperative computed tomography follow-up evaluating the degree of reduction and remaining dislocation. J Oral Maxillofac Surg. 2008 Nov. 66(11):2302-7. [Medline]. Smyth AG. A modified miniplate for use in malar complex fractures. Br J Oral Maxillofac Surg. 1995 Jun. 33(3):169-70. [Medline]. Czerwinski M, Izadpanah A, Ma S, et al. Quantitative analysis of the orbital floor defect after zygoma fracture repair. J Oral Maxillofac Surg. 2008 Sep. 66(9):1869-74. [Medline]. Baylan JM, Jupiter D, Parker WL, Czerwinski M. Management of Zygomatic Fractures: A National Survey. J Craniofac Surg. 2016 Jul 14. [Medline]. Snäll J, Kormi E, Koivusalo AM, Lindqvist C, Suominen AL, Törnwall J, et al. Effects of perioperatively administered dexamethasone on surgical wound healing in patients undergoing surgery for zygomatic fracture: a prospective study. Oral Surg Oral Med Oral Pathol Oral Radiol. 2014 Jun. 117 (6):685-9. [Medline]. Thorén H, Snäll J, Kormi E, Numminen L, Fäh R, Iizuka T, et al. Does perioperative glucocorticosteroid treatment correlate with disturbance in surgical wound healing after treatment of facial fractures? A retrospective study. J Oral Maxillofac Surg. 2009 Sep. 67 (9):1884-8. [Medline]. Waters view demonstrating a zygomatic complex fracture involving the zygomaticofrontal suture, inferior orbital rim, and opacification of the maxillary sinus. CT scan of the orbit demonstrating disruption of the zygomatic arch. CT scan demonstrating disruption of the lateral wall of the orbit and medial inferior orbital rim.